Stoic Week 2014 is an online and international event taking place from Monday 24th to Sunday 30th November. This is its third year. Anyone can participate by following the daily instructions in the Stoic Week 2014 Handbook, which will be published online. You will be following the Stoic practices of philosophers such as Marcus Aurelius, Seneca and Epictetus, for seven days, and discussing the experience of adapting them for modern living with other participants in our online forums. The aims of the course are to introduce the philosophy so that you can see how it might be useful in your own life and to measure its potential therapeutic effectiveness. More about the Stoic Week online course below. In addition to taking part in Stoic Week online, if you live in and around London, you can book your place for the Stoicism Today – Stoic Week Event. This is being held at Queen Mary, University of London (Mile End campus) on November 29th. There are 300 places for the event. This is the biggest annual gathering of people interested in Stoicism. The day will feature talks by experts on Stoicism, life stories by those who have practised it and a whole range of workshops to choose from (including on Stoicism, nature and the environment; Cultivating a wise relationship with technology; Stoicism at work; Lives transformed: personal accounts of Stoic healing; Guided Stoic meditation; Stoicism and love; Stoic ethics under pressure). There will also be discussion on how Stoicism is being used in schools, UK prisons, the army and business. In addition to the Stoicism Today team (Chris Gill, John Sellars, Gill Garratt, Tim LeBon, Jules Evans, Patrick Ussher, Gabriele Galluzzo and Donald Robertson – read more about its members here), special guests will include Prof. Angie Hobbs (Professor of the Public Understanding of Philosophy at the University of Sheffield), Nikki Cameron who runs the philosophy club at Low Moss prison and Mark Hardie, former Marine and resilience coach. To get an idea of the day, you can see a video of last year’s London event here. You can find audio resources (guided meditations to download) for the course here. You will receive an automatic email with further instructions, which are also available once you enrol on the modernstoicism website. The Stoic Week 2014 Handbook is now available on the modernstoicism website. You can also download it here and follow the week without registering on modernstoicism.com but in order to take part in the experiment, and discuss Stoicism with others following the course, you are encouraged to register on the modernstoicism website. Please note that due to high levels of traffic the modernstoicism.com site has been experiencing some down-time. If you can’t get through, please try again later. We are working to resolve these technical difficulties. If you would prefer to take part in the course without registering on the modern stoicism website, you can do so. Follow the instructions here. Are you a teacher? We have developed an easy to use lesson plan for teachers which you can use to introduce Stoicism to your students. 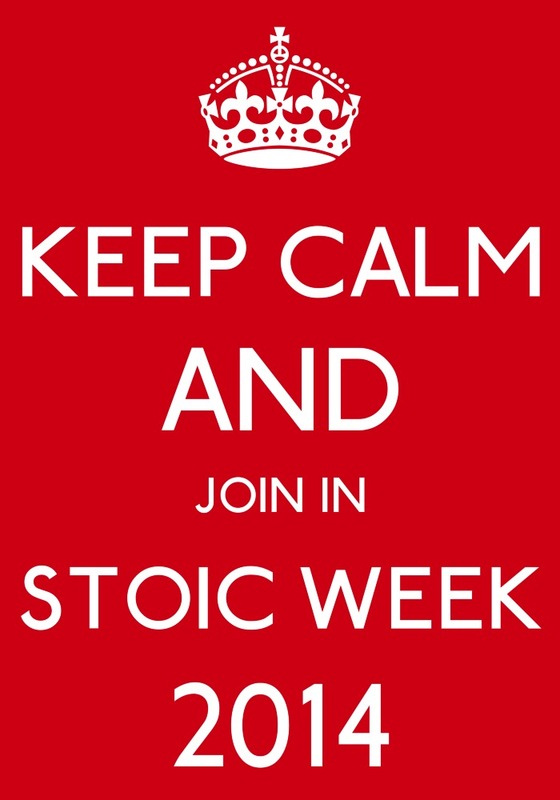 60 schools world-wide have already signed up to take part in Stoic Week. If you would like to run a feature Stoic Week, please get in touch. You can read of the previous media interest in Stoic Week here. All of the mp3 files are named to correspond to their exercise, morning meditation, evening meditation, etc, which should make it straightforward to identify which is which when importing. Or do they show up as different names on your computer? Pingback: Hörwolle » Blog Archive » Erinnerung: Stoic Week 2014 startet heute! Received the Test Email – no where to acknowledge receipt – all very confusing – look forward to starting the course next week and to the day in London on 29th. Hi, apologies for the down-time and delays. The site has been struggling with the volume of traffic, and needed some tweaking. We’re currently making other adjustments. I think the performance has already improved and should be much better by the start of the course. Everyone who creates an account should normally get a confirmation email. If not, please check your spam folder as they often end up in there – there’s not much we can do about that except advise people to add the domain to their email client’s whitelist. If you have any problems please get in touch with me. You can use the support option in the main menu to send me an email. Modernstoicism.com is down at the moment. Excuse the typos! I meant more than “three times”, etc. I registered to enroll in the Stoic Week course at said website above hours ago, still waiting for the confirmation in my email, which has not arrived yet- taking a very long time. I would contact the “site administrator as suggested for said case but cannot find a link to that nor contact info. Have forwarded this to Donald Robertson, Michelle. Hopefully it will be resolved, soon. Thank you very much Patrick! I still haven;t received an email from the site. I tried more than tree times to re-register yesterday and each time it said I should be receiving an email.